I’m loving this new addition to my flat: a geeky maths/science clock. It was designed by myself and Albert and then built by Kate Wharmby, who is also very talented at making stained glass and has made me a lovely trefoil knot too. I thought I would go through the numbers and say what they mean and why we chose them. All physical constants are in standard SI units. ℏ × 1034 = 1.05 is the reduced Planck constant; that is, the Planck constant divided by 2π. This number relates the energy of a photon to its angular velocity and is one of the basic units in quantum mechanics. Its existence means that energy only comes in discrete packets, or quanta, which was a massive discovery in 20th century physics. is the sum which turns out to be exactly equal to 2. It’s an example of a geometric series and was first discussed in ancient Greece when Zeno came up with his paradoxes. He claimed that motion was impossible, because before you could get somewhere you’d have to get halfway there, but then you’d have to get halfway to the halfway point and so on. However, despite the infinite number of steps in the sequence it actually has a finite value. c × 10-8 =2.9979 is the speed of light in a vacuum, measured in metres per second. The theory of relativity says that this is constant, regardless of the observer, and that nothing in the universe can go faster than this. The fact that c is constant leads to lots of crazy consequences, such as time passing slower for moving objects and moving objects shortening in length. is the integral (area under the curve) of the natural logarithm function between and . Logarithms were invented by the Scottish mathematician John Napier and are important in many branches of maths and science. The natural logarithm is related to the mathematical constant e, which arises whenever a quantity is growing at a rate proportional to its current value; for example, compound interest. det(12n488) is the determinant of the 488th non-alternating 12-crossing knot. This was a knot which featured in my thesis, as I used new techniques to show that it had infinite order in the knot concordance group. Finding the determinant was the first step in this method. You can find tables of knotty things on the website KnotInfo, including any values which are still unknown. 29ii = 6.03 shows off the surprising fact that an imaginary number (the square root of -1) to the power of an imaginary number is actually a real number. Actually, ii is equal to . is the golden ratio squared and then squared again. The golden ratio arises if you want to divide a line into two parts so that the ratio of the larger to the smaller part is the same as the ratio of the larger part to the whole line. It is often described as the most aesthetically pleasing ratio, and is also the ‘most irrational’ number in the sense of being most badly approximated by rational numbers. NA.kB = 8.314 is the ideal gas constant which relates the energy of a mole of particles to its temperature. It is the product of NA, which is Avogadro’s constant (the number of particles in one mole of a substance – see 12), and kB, which is the Boltzmann constant (which relates energy of individual particles to temperature). me × 1031 = 9.109 is the rest mass of an electron which is one of the fundamental constants of physics and chemistry. It is actually impossible to weigh a stationary electron, but we can use special relativity to correct our measurements of the mass of a moving electron. g = 9.81 is the acceleration of objects in a vacuum at sea level due to Earth’s gravity. This is actually an average value, as the force of gravity varies at different points on the Earth’s surface. Things affecting the apparent or actual strength of Earth’s gravity include latitude (since the Earth is not a perfect sphere) and the local geology (since the Earth does not have uniform density). The force is weakest in Mexico City and strongest in Oslo. = 11.23 is a combination of everyone’s favourite mathematical constants, pi and e. These numbers are not only irrational but are transcendental, meaning that they are not the roots of any integer polynomial equation. It is still unknown if is transcendental, although we know that is. 12C = 12 is the isotope of carbon having six protons and six neutrons in its nucleus, giving it a mass of 12 atomic mass units. More importantly for chemists, IUPAC defines the mole as being the amount of a substance containing the same number of atoms (or molecules, electron, ions etc) as there are the number of atoms in 12g of carbon-12 (which is Avogadro’s number – see 8). Which one was your favourite number? 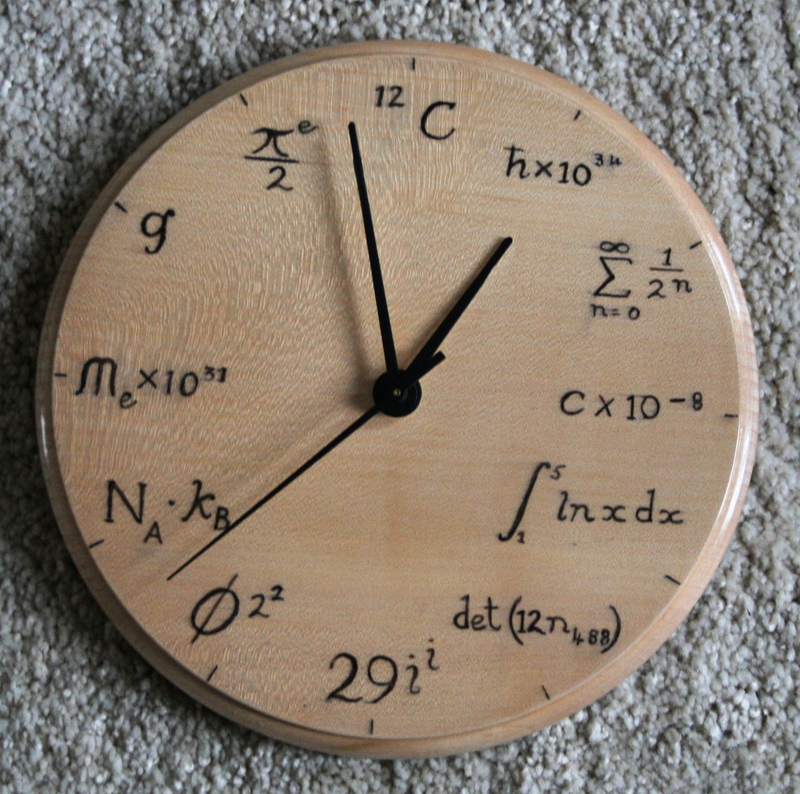 If you were designing your own geek clock, what numbers would you pick? Leave your answers in the comments! There’s typo in the geometric series (n instead of -n).